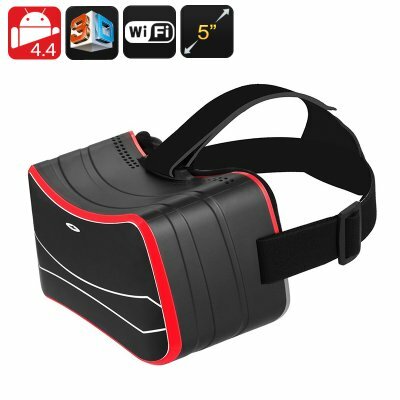 Successfully Added Android 3D VR Glasses - 3D Side By Side, Gyroscopic Sensor, 5 Inch HD Screen, Quad Core CPU, Wi-Fi, Bluetooth, Micro SD Slot to your Shopping Cart. Th VR1 is a dedicated Android virtual reality headset with a 5inch HD IPS screen that will bring 3D side by side images for an immersive 3D experience. With Wi-Fi connectivity you can play 3D movies directly from YouTube or Visit the Google Play store for a range of 3D apps letting you watch concerts or walk on the moon as though your actually there. Thanks to micro SD storage you can play content direct from the headset and won't need to be tethered down with any cables, so you can enjoy VR and 3D entertainment on the go. The 3.5 mm audio output lest you wear headphones and get stereo quality audio direct in your ears while using these VR glasses so you won't be disturbing those around you. A built in 2500mAh battery brings about 2.5 hours of continuous usage time so you can watch a full length movie to break up those long tedious journeys. The VR glasses have a built in gyroscopic sensor that will track you head movements and adjust the screens view accordingly so you have the freedom to explore 3d worlds as you please. You can play 2D or 3D videos by switching between play modes with the conveniently located navigation buttons on the underside of the screen. These will also let you navigate the menus when setting up the glasses, browsing YouTube or surfing the web. Alternatively link up a controller via USB port or wirelessly through Bluetooth. This Android VR Headset comes with a 12 months warranty, brought to you by the leader in electronic devices as well as wholesale virtual reality glasses.